The Synthrotek Passive Ring Modulator PCB is the classic 2 transformer - 4 diode ring modulator circuit in a conveniently small package. Passive ring modulation is a bizarre and otherworldly sound effect appearing in such diverse places as sci-fi robot voices, trippy psychedelic guitar solos, metallic analog synth samples, and more! There's nothing on this planet that sounds like ring modulation and now you can get it for cheap! Experiment with all of your gear and you'll definitely come up with some surprising tones you never knew you had access to. The three jacks are Carrier Wave 1, Carrier Wave 2, and Output. Plug two different signals into Carrier Waves 1 & 2 and listen to the sound flow. You can actually use any two jacks as inputs and the third as the output; each combination gives you a different sound. 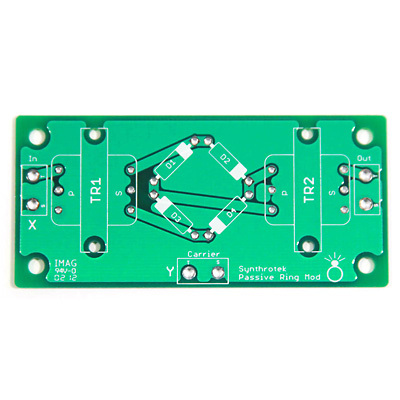 Measuring 2 9/16" x 1 3/16", the Synthrotek Passive Ring Modulator PCB is a compact, high quality circuit board manufactured by Imagineering out of Elk Grove Village, IL. The layout is a custom design by our resident electronics engineer, Steven S. The PCB allows for the transformers and diodes to be soldered directly to the board neatly and a ground plane helps reduce interference from external noise and RF. Use it as a standalone unit or as a module, the Synthrotek Passive Ring Modulator PCB is a great addition for your next synth project! Note: the Passive Ring Modulator needs a hot signal in order to get an effect. Guitar signals and some line level signals will need to be boosted. Want to make your Passive Ring Mod active? Check out our Mod HERE.